(Trent Nelson | The Salt Lake Tribune) Utah Royals vs. Washington Spirit, soccer at Rio Tinto Stadium in Sandy, Saturday May 5, 2018. Royals players celebrate a goal by Utah Royals FC defender Kelley O'Hara (5). Herriman • Far be it for a team that features a host of uber-talented soccer players to worry about anything at all coming into a National Women’s Soccer League season. 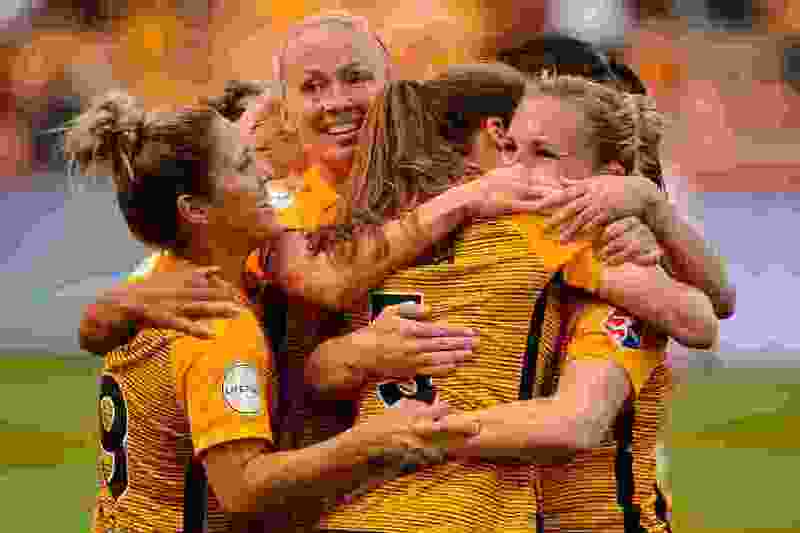 But the Utah Royals have something of a dilemma on their hands as they enter their second-ever campaign. With 2019 being a World Cup year, every NWSL club will have players cycling in and out of their respective teams to train for the most prestigious women’s soccer tournament in the world. The Royals will be one of the teams affected the most, as they have seven players expected to be called up for World Cup duty when the tournament arrives this summer. It has already been happening some over the past few months for smaller tournaments that serve as tune-ups of sorts for the real deal. The Royals likely to miss time during the 2019 season are: Christen Press, Becky Sauerbrunn and Kelley O’Hara for the U.S.; Desiree Scott and Diana Matheson for Canada; Katie Bowen for New Zealand; and Rachel Corsie for Scotland. Newly acquired Vero Boquete has played for the Spanish national team in the past, but will not do so this year. The roster fluctuation may not matter as much if the Royals didn’t have their eyes set on capturing an NWSL title this season. But they do, which means they’ll have to figure out how to navigate missing their best players for a significant stretch of the season. Harvey looks at the 2019 as split into three parts: pre-World Cup, World Cup and post-World cup. She said whatever team can succeed in as many of those sections will come out on top at the end of the year. But navigating the situation throughout the season won’t be easy. Just this week, Press, Sauerbrunn and O’Hara returned to the team after playing in the SheBelieves Cup, but the Royals have been participating in preseason preparation for over a week. Tuesday was the first day the entire team was on the same practice field, and also the day Bowen was called up for two international friendlies with New Zealand. So at least while the seven players are with the team, the remaining Royals will try to get as much out of them as possible. Collectively, the Royals aren’t necessarily concerned about how they will play when the national team players are away. The reason for that may be due to the organization bringing back the majority of the roster this year, adding Boquete and drafting three players who may be able to contribute right away. Erika Tymrak said having all those players out gives others a chance to get more paying time, showcase their abilities and take on more of a leadership role. Abby Smith spoke of the team’s depth and thinks it will be imperative to use all of its resources to be successful in 2019. “I think it’s also gonna be important that we utilize everybody here just because everyone has a big role and this is a big year to fulfill that role and to really embrace everybody that’s on the team and embrace the good and the bad,” Smith said. The Women’s World Cup is in France this year and goes from June 7 to July 7.